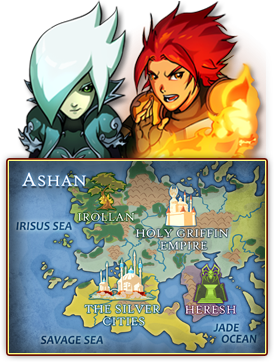 Sylvans lack attack and defensive powers but have increased speed on the battlefield. Players who enjoy hitting their opponents quickly and often will gravitate towards this faction. The fastest unit in Sylvan, swiftly firing off arrows in a single turn. Fires a magical burst of pixie dust that draws its strength from the Hero's MP bar. Ferocious and hard-hitting warriors of the forest. Casts a magical vine spell that increases the Charge Time of any enemy formations it hits by X* turns. Gracefully jumps over X* row of enemy walls. While charging, defends itself and surrounding columns with a protective aura. Sprouts vines across the battlefield which drain health from the enemy every turn, replenishing your Hero. Sprays acid on the battlefield that stays for X* turns, damaging any enemy units that it touches. A feudal Holy Empire, protected by knights and monks with access to "Light/Life" magic, slightly favoring defensive attributes. 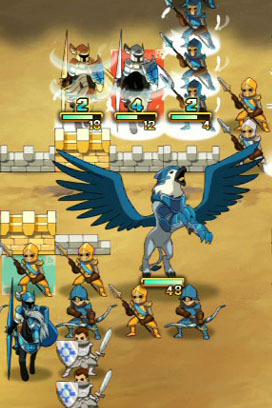 Players enjoying to build a strong defense and strike with swift counter-attacks will like this faction! The strongest warriors out of all Haven Core units. Able to strike the enemy first using their long spears. The fastest unit in Haven, firing quick and deadly arrows across the battlefield. RWhile charging, is protected by a shield worth 50% of his Max power. Heals your Hero while charging, then fires a powerful energy blast across the battlefield. Heals your damaged units each turn as it charges, before firing a strong blast of holy light at the enemy. When it encounters a stronger formation it performs a Battle Dive, doubling its strength. At the start of every turn, the Sword Master slams his sword into the ground sending a shockwave into the enemy's column. This faction is a magical powerhouse and benefits from increased magical abilities. However, the Academy suffers in attack strength and has weaker defensive capabilities. Players that enjoy status altering magical spells will appreciate the unorthodox and varied tactics that the Academy provides. Attacks the enemy with stinging magical orbs. Shoots a magical blast that deals heavy damage to the first enemy row, but then weakens as it travels further. Powerful automaton armed with deadly Scimitars. Casts a bolt of lightning that spreads through any idle units it touches. 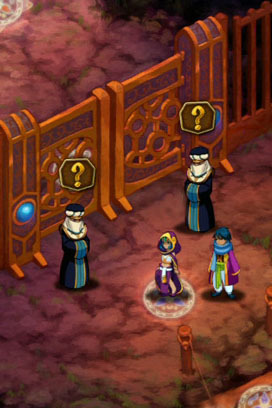 The Djinn attack freezes every formation it hits for X* turns. Frozen formations can be easily shattered when hit. Hits the enemy Hero and depletes an equal amount of both their HP and MP. 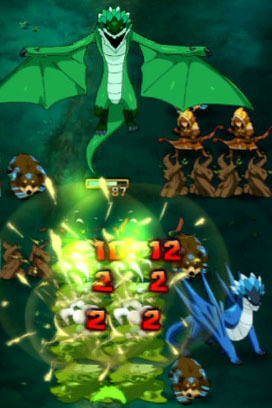 Pounds the ground sending a shockwave across the enemy's battlefield, damaging connected enemy walls. Spreading fire in its path, the Phoenix resurrects your Formations once if they die while its charging. 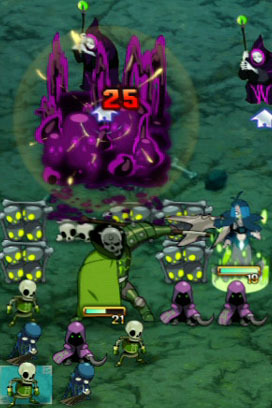 These undead necromancers utilize the darkest technique to assault their enemies with rotting, undying troops. 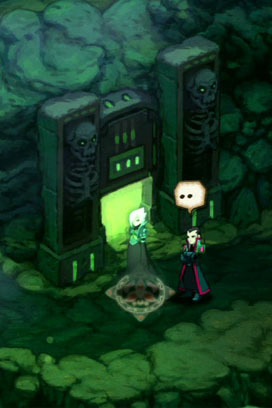 With "Dark" magic on its side, the Necropolis faction benefits from increased defensive abilities and strong magical attributes. Wield their bony skulls like clubs, head-butting anything in their path. Slash wildly with cleavers, spreading a life-draining plague to any enemies they touch. Armed with sharp ritual daggers, they are the most powerful of all Necropolis Core units. Drains the blood of its terrified enemies and transfers the health to your Hero. 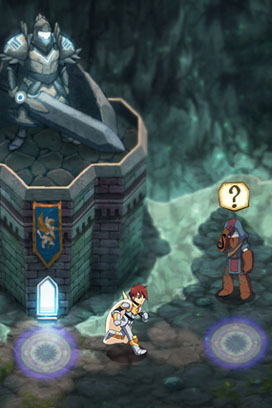 Enemy attacks will take damage as they pass through a charging Ghost, but the Ghost will remain unharmed. 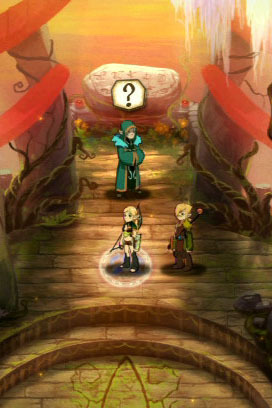 Swallows idle enemy units and uses their Power to increase its attack power. While charging, the Death Knight draws his power from enemy formations. Delivers instant death to anything it hits, including the enemy Hero. The chaotic demon horde relies on pure power to crush its enemies. 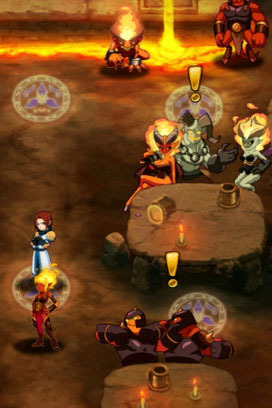 Inferno battle units have increased attack power to make up for their weak defensive capabilities. Though slower than most armies, players will be able to utilize many powerful offensive strategies with this faction. 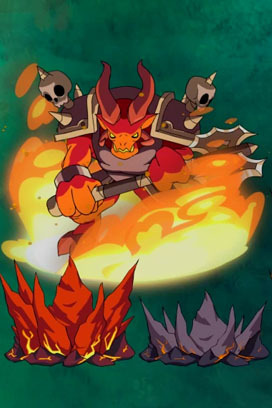 With their jagged claws, they inflict the most damage of all Inferno Core units. 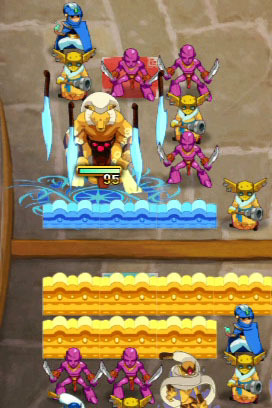 When the imp hits an enemy formation, it explodes dealing splash damage. The fastest Inferno Core units, Hellhounds are a Hero's best friend. Fires 4 explosive blasts of hellfire that also damage any units surrounding their target. All Nightmare formations will launch in unison, regardless of their remaining Charge Time. Launches dark magic that instantly breaks apart any enemy formation it hits, turning it idle. Absorbs some power from fallen ally formations. The Vorpal Sword's devastating blow leaves behind the burning corpse of any defeated units.